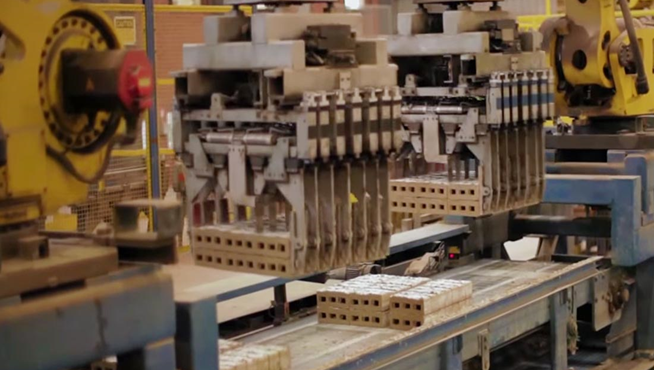 BETA Bricks, Zimbabwe’s largest clay brick manufacturer is expanding its operations. The company is a subsidiary of BETA Holdings, which also incorporates BETA Concrete and BETA Logistics. BETA Bricks is the first brick manufacturing entity in Zimbabwe to receive certification for integrated ISO management systems: ISO 9001:2008 (Quality Management System), ISO 14001:2004 (Environmental Management System) and OHSAS 18001:2007 (Occupational Health and Safety Management System). The Standards Association of Zimbabwe also approves all BETA Bricks products. BETA Bricks is the flagship of the BETA Group, being the largest subsidiary by both production and market share in its sector of clay brick manufacturing. BETA Bricks offers a range of clay bricks ranging from the popular common brick and over 15 different types of face brick. The company currently operates a Steele 50 and Steele 75 plant, as well as a specials (face brick) plant in Mount Hampden. The Mount Hampden factories are currently operating at 93% capacity, producing about 170 million bricks annually, and there is need to install additional capacity in order to meet ever-growing market demand and to enable BETA to defend its market leadership position. 2018 production is projected to be in excess of 170 million bricks, a significant growth from 2017 volumes, however, this, compounded with seasonal downturn during the rainy season, will be inadequate to meet market demand. It is against this background that BETA Bricks has identified part of Blue Water Farm in Melfort as suitable land for the establishment of an additional clay brick factory. This factory will be the largest brick making plant in Zimbabwe. The first phase of the project will involve the installation of a brick making plant, construction of a residential village for workers, as well as construction of an administration office. In order to commission the factory successfully, BETA has identified the following as key enablers for the project. It is envisaged that through smart partnerships and with the support of the local authorities and Government these enablers will be adequately addressed. BETA Bricks’ value proposition is anchored on a technology driven, cost leadership system centred on best quality products and providing a total customer solution. BETA Bricks have a distinct competitive advantage over industry rivals through offering a high quality clay brick augmented with superior value added logistics and ICT infrastructure and a unique customer relationship management model. The JC Steele 90 plant has a total installed capacity of 155 million bricks. BETA Bricks will be investing in between US$8-10 million directly towards the establishment of the MELFORT plant. This will go towards the acquisition of core equipment, being the JC Steele 90 plant, ancillary equipment such as excavators, front-end loaders and grabbers, as well as for infrastructure such as power supply, construction of staff housing and civil works. At full capacity, BETA will create over 400 new jobs for the surrounding community. The offshoot business from having a vibrant manufacturing operation in the area also expects to result in a number of downstream businesses such that the local community will benefit socially and economically from the establishment of BETA Bricks plant. The Group will also be extending its Corporate Social Responsibility programs in Education, Health and Environmental Management within the community. BETA Bricks intends to collaborate with the relevant local authorities in the maintenance of local roads that link the project site to the main Harare – Mutare Highway. The company will also support the local clinic to ensure that it can accommodate the additional numbers stemming from the establishment of the business. In addition, BETA will also support local schools financially and materially in order to improve facilities to cater for increased enrolment emanating from the new workforce. BETA Holdings is cognisant of the environmental impact of its operations and is committed to investing in sustainable environmental management programmes. BETA Bricks has already started implementing initiatives to reduce the negative impact of its operations on the environment, whilst the company has also extended various ISO 18001 initiatives adopted at its bricks, tiles and concrete plants such as land reclamation and the BETA Environmental Education Programme to the new operation. The construction phase is expected to take between 9 – 12 months. The project is expected to be commissioned in the second quarter of 2019. BETA Concrete, a subsidiary of BETA Holdings, the parent company to Zimbabwe’s largest clay brick manufacturer is expanding its operations. BETA Holdings also incorporates BETA Bricks and BETA Logistics. The company is the first brick manufacturing entity in Zimbabwe to receive certification for integrated ISO management systems: ISO 9001:2008 (Quality Management System), ISO 14001:2004 (Environmental Management System) and OHSAS 18001:2007 (Occupational Health and Safety Management System). All BETA products are also approved by the Standards Association of Zimbabwe. In line with the Group’s strategic vision to become the market leader in the supply of key infrastructural inputs in Zimbabwe and the region, BETA Concrete has identified and procured granite claims in Goromonzi West for the purposes of establishing an aggregates quarry. The claims are nestled in the Svisva range of mountains in Goromonzi West, 40kms from Harare. The company’s resource consists of two “Special Block’ granite claims measuring 98 hectares and 150-hectares, which both more than satisfactorily meet test requirements for both surfacing and concrete works. The Goromonzi West granite deposit has the capacity to produce high quality aggregates with reserves the resource base on both claims estimated to have a lifespan of over 100 years. 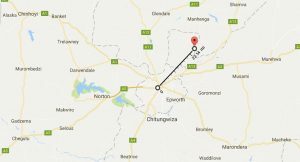 To this end BETA is strategically positioned to become the biggest quarry supplier to Harare and surrounding areas in the medium to long term (See Arial Map below). The claim’s location away from the City gives the site a competitive edge over its main competitors who face the imminent risk of closure in the medium to long term future due to conflict with the fast growing urban settlements and economic resource depletion. With no ground breaking additional capacities on the horizons, the possibility of new entrants in the aggregate sector remains low especially in light of the scarcity of economic aggregate reserves in and around Harare. The need for new infrastructure development and maintenance of existing highways and urban road networks is now taking centre stage of the country’s economic turn-around. The proposed shift by government from the traditional bitumen roads to concrete paved roads should stimulate further demand for aggregates on a phenomenal scale. 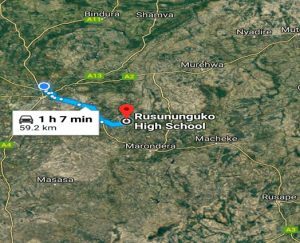 The total distance from Harare CBD to the site is 37km. In order to successfully commission the factory, BETA has identified the following as key enablers for the project. The nearby lake will supply all water requirements for the aggregate plant, dust suppression systems and its workers. Beta will take the necessary steps to obtain Borehole water abstraction permit from the Zimbabwe National Water authority for drawing from the underground water. 12.2 km from the Chabwino farm turn off to site is wide gravel road requiring refurbishment, widening and construction of a culvert bridge. BETA Aggregates is anchored on a technology driven, locked in system centred on best products and providing a total customer solution. BETA Aggregates will have a distinct competitive advantage over industry rivals through a unique and superior finish resulting from the latest (VSI) technology for an enhanced final product finish. The total surface extent of the target area of the claim is 250 hectares. At a minimum mining depth of 50 metres, with a specific gravity (SG) of 3.8, the resource is estimated to yield more than 620 million tonnes of high quality aggregates over its lifespan. 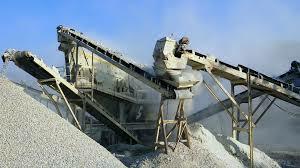 BETA Concrete will be investing between US$6-8 million directly towards the establishment of the Aggregates plant. This will go towards the acquisition of the processing plant including the Vertical Shaft Impactor , ancillary equipment such as excavators, front end loaders and grabbers, as well as for infrastructure. At full capacity BETA will create over 100 new jobs for the surrounding community. The offshoot business from having a vibrant mining operation in the area is also expected to result in a number of downstream business such that the local community will benefit socially and economically from the establishment of BETA Aggregates mining and processing plant. The Group will also be extending its Corporate Social Responsibility programmes in Education, Health and Environmental Management within the community. BETA Aggregates has already invested nearly half a million dollars towards an access road and bridge to the site, which road already benefits the community. The company intends to partner with the relevant local authorities in the maintenance of other local roads that link the project site to the main Harare Shamva -Highway. The company will also support the local clinic to ensure that it can accommodate the additional numbers stemming from the establishment of the business. In addition, BETA will also support local schools financially and materially in order to improve facilities to cater for increased enrollment emanating from the new workforce. BETA Holdings is cognisant of the environmental impact of its operations and is committed to investing in sustainable environmental management programmes. BETA has already started implementing programmes to reduce the negative impact of its operations on the environment, whilst the company has also extended various ISO 18001 initiatives adopted at its bricks, tiles and concrete plants such as land reclamation and the BETA Environmental Education Programme to the new operation. The construction phase is expected to take between 6 – 9 months. The project is expected to be commissioned in the last quarter of 2018.